Airtron Heating and Air Conditioning offers reliable heating and air conditioning service in homes all around the San Antonio, Texas metro area. Since 1970, Airtron San Antonio’s focus has always been on keeping residents cool during those oppressively hot days and warm when the mercury drops. When it comes to heating repair and AC installation services around San Antonio, the knowledgeable HVAC technicians at Airtron Heating and Air Conditioning are here to help. Our HVAC services include: heating repair, air conditioner repair, AC & furnace installation, and more. 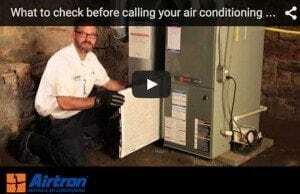 Call Airtron San Antonio today. This is where the experts at Airtron Heating and Air Conditioning come in. Airtron San Antonio has been a part of the western Texas community for more than thirty years, so you know you can trust us to handle your heating and air conditioning service needs. There’s no denying it, winter in San Antonio can be brutal! Don’t get caught in the cold without a working home heating system. Our HVAC technicians are trained to handle all heating repairs and furnace installation. When it comes to commercial HVAC service in San Antonio, our experts can help see your project through; from conceptual estimate and planning, all the way through construction. Thousands of homeowners rely on Airtron San Antonio for dependable heating and cooling all year round. But don’t just take our word. Read what your neighbors are saying about our services. Airtron is focused on providing the right heating or air conditioning system for both your home and family’s needs. Our process includes sending a fully trained HVAC specialist to your home to analyze your heating or cooling needs and provide you with the necessary information and recommendations to choose the right air conditioner or furnace. This very process has won a Airtron San Antonio a good deal of recognition including Better Business Bureau (BBB) accreditation. Our primary concern is your family’s comfort, which is reflected in both the quality and the reliability of every AC and heating system we service. No matter the season, Airtron San Antonio is dedicated to keeping your home comfortable all year round. As always, our commitment is to our customers, for whom we provide excellent service and knowledgeable technicians, helping to set us apart from the competition. Let the heating and air conditioning repair and installation experts at Airtron San Antonio give you service that you and your family can really depend on! I always have a great experience with Airtron. I have been using you all since I purchased my home in 2005. Billy Bray is an awesome technician, and I always ask for him for my service calls. He is knowledgeable, honest, and friendly. Great job Airtron! Customer service and the technician that was sent to our home was very professional, courteous, and knowledgeable. We are very happy with the quality of service that we received in a timely manner. Thank you! I was very impressed with the level of professionalism provided over the phone, the quick response to helping me get my air conditioner back up and running, and both technicians were professional, knowledgeable and friendly. Many thanks to everyone!! We have been very satisfied and remain so for years with Airtron. They are the only ones we count on for our AC service. Keep up the good work!